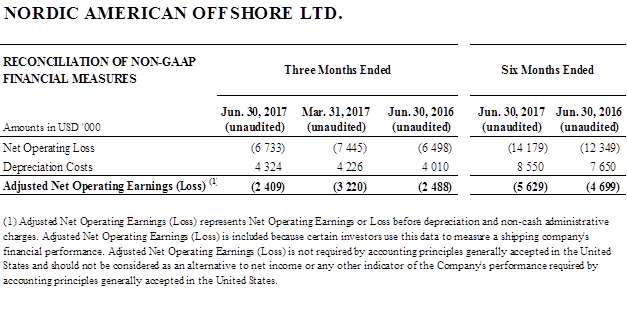 Nordic American Offshore Ltd. (NYSE:NAO) – 2Q2017 Dividend and Earnings Report. NAO is in a solid financial condition. Hamilton, Bermuda, August 3, 2017. NAO has ten high-quality Platform Supply Vessels (PSVs) built in Norway in the period 2012-2016. Seven of our ten vessels are in operation. Going into the third quarter, an improvement in the PSV market has taken place. In a volatile market, the longer it lasts, the better. The basic features of NAO are similar to the business model of the NYSE listed Nordic American Tankers Limited (NAT) which is a strong company. Nordic American Tankers Limited (NAT) holds 22.6% of NAO common shares and the immediate Hansson family, including the Executive Chairman, holds 10.8% of NAO commons shares. The Board has declared a dividend of $0.02 per share for 2Q2017 to shareholders of record as of August 17, 2017. The payment of the dividend is expected to take place on or about August 31, 2017. Since its establishment in late 2013, NAO has paid dividends for 14 consecutive quarters, totalling $2.63 per share, including the dividend to be paid on or about August 31, 2017. NAT has announced that its shareholders are expected to receive NAO shares as a part dividend payment from NAT during August 2017. Following such distribution, NAT is expected to own about 16% of NAO. Currently, NAO has about 35,000 shareholders. When NAT shareholders receive NAO shares as a dividend, it is expected that the number of NAO shareholders will increase. NAO pursues a conservative financial policy. 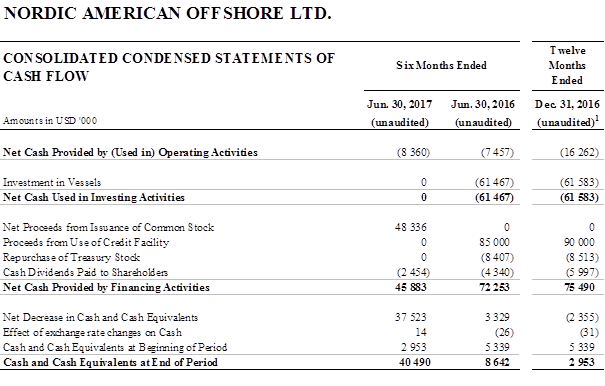 At the end of 2Q2017, the net debt per vessel was $9.5m. NAO has in place until early 2020 a non-amortizing credit facility of $150m. Going forward, the first objective of NAO is to reach cash break-even level. For further details on our financial position, please see later in this release. Our 2016 Annual Report (Form 20-F) contains information about NAO. This report was filed with the SEC April 24, 2017. It is on our web site www.nao.bm. 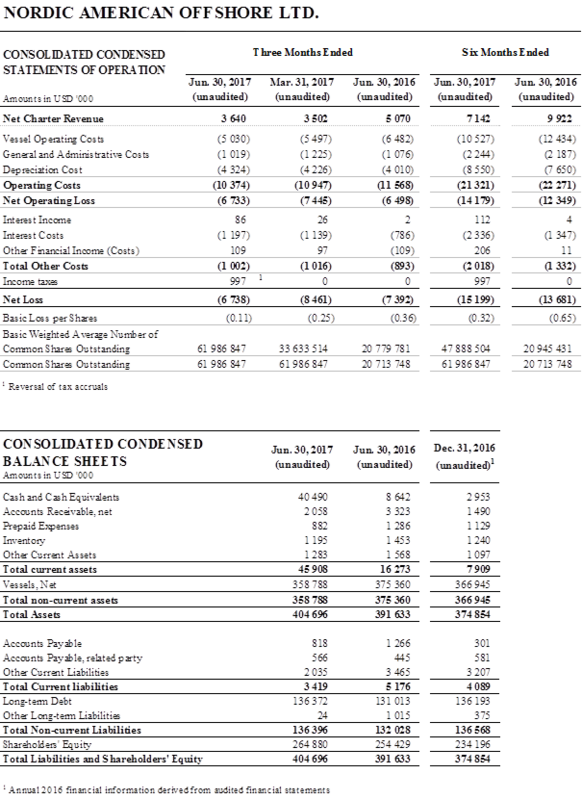 The main elements of NAO’s strategy are based on quarterly dividends, low G&A costs and liquidity in the stock. We seek to achieve a competitive cash yield and a satisfactory Total Return, a precise measure of value creation. NAO is committed to protecting its underlying earnings, dividend potential and strong balance sheet. We shall endeavor to safeguard and further strengthen NAO’s position in a deliberate, predictable and transparent way.